It has come to that time of the year where my beloved Brompton has had to go in for its six month service. My Brompton has only ever had this once and that was its first 100 mile service when it was brand new. This is for real. I took my bike to a Specialized shop in central London and the man there said that it was very clean. I said that I liked to keep it that way. For £40 they will tighten all the important bits, oil and grease where necessary, clean the chain and tighten any cables that might have become lose over the months. I'll let you know how it went once I get it back in a couple of days. I would like to one day be in a position to do some of this myself. I will have to take a Brompton maintenance course run by one of the bike shops in London. While there I saw a few other Brompton's that must have been booked in for a service. One was that pale blue colour with black extremities. I think if I were to do it all again that colour combination might appear on my shortlist. By the time I get my Brompton back I should be able to start riding again - something I have missed greatly. I have also managed to get a pair of cargo shorts that look like cargo shorts, have the cut of a pair of cargo shorts and to the causal observer are a pair of cargo shorts. They are however devilishly clever has they have a gel pack lining thus padding all the important vulnerable areas. They also don't look like baboons bottom which is so common in many cycling shorts I have seen. I am going to have to get some serious training in for the BWC's. I have quite a short route to work of about 4 miles there and back, so I need to start putting in the miles. 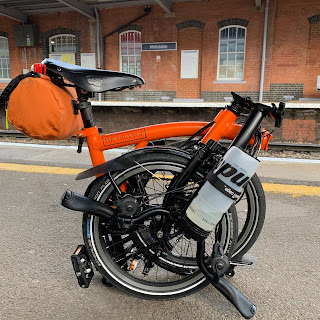 So, should you see an Orange Brompton in Central London, it just might be me. C-run alongside as if you are on a climb in "le tour"